Gary Witherall and his wife, Bonnie, heard God’s call to tell people in the Middle East about Jesus. 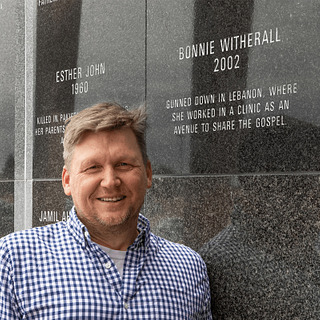 They answered that call by moving to Lebanon, where they served with Operation Mobilization, building relationships with Lebanese people and Palestinian refugees—until the day Bonnie was martyred in the clinic where she served refugee women. Listen as Gary shares about how God called them to the Middle East, what their work there was like and how each day of their ministry was unique. He’ll also share how things changed on 9-11, when Gary and Bonnie saw people all around them celebrating the murder of more than 3,000 Americans. After the attacks, they found their life and ministry more difficult, but they never considered leaving. In fact, it was after 9-11 that Gary and Bonnie determined they would stay and serve the Lord—no matter the cost. “I think we were martyred on that day,” Gary says. You’ll be challenged as Gary asks the question: what do you love so much you’d be willing to die for it? Be sure to join us next week on VOM Radio as Gary tells about the day Bonnie gave her life for Christ. You can learn more about Gary’s story by reading his book, Total Abandon (affiliate link).